Or post office, or store. And only three permanently constructed homes. How is it that the disciples have little faith, when they cry to Jesus to save them? The disciples in question probably would have counted among their number at least three professional fisherman (and boat-handlers), and Jesus' trade as carpenter and preacher probably didn't offer much at the moment. Yet they clearly have some faith that he can save them. Is it faithless to ask Jesus for help? When the winds came and beat upon them, and the rain descended and the floods came, the disciples were afraid, ignoring what Jesus had said about His own teaching. How good would it be for others if His house would fall when the winds came? And so we see how the disciples do not yet believe, for they do not take Jesus at His word. Click on any of the pictures for a closeup. West Central Pennsylvania is dominated geographically by a landform known as the Allegheny Plateau. This plateau rises slowly from the west, starting near the Ohio border, and terminates in the Allegheny Front, a bold escarpment separating the lower ridge-and-valley province of the Allegheny Mountains from the higher plateau. 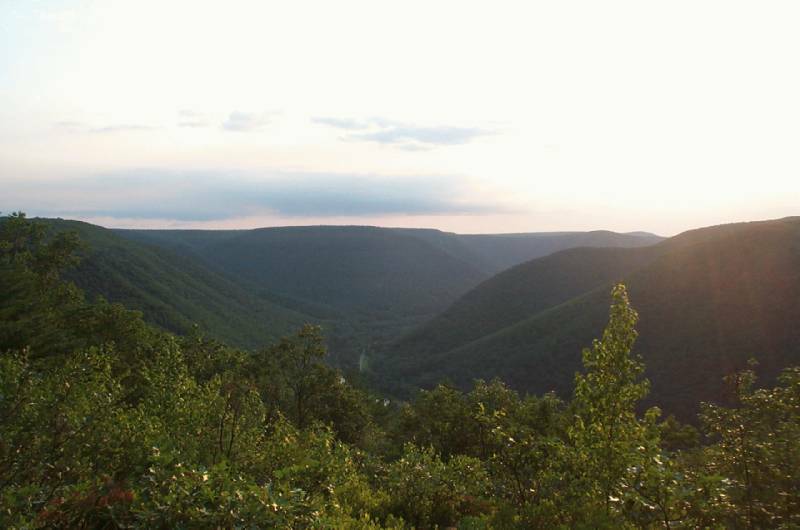 In Clearfield County, another escarpment divides the plateau itself into the lower Pittsburgh Plateau and the Allegheny High Plateau in the north. And it's the geography of the Allegheny High Plateau that provides these beautiful scenes. If you take the Quehanna Highway from Clearfield, you will find the Three Runs Road (just past the town of Piper), a dirt road winding into the woods of the Sproul State Forest. Now you may think you're lost, but relax- it's just the wilds of Central Pennsylvania. You'll pass a hunting camp or two, but there's no permanent habitations here in the Quehanna Wild Area, a 48000 acre wilderness area sectioned off by the state for old growth protection. 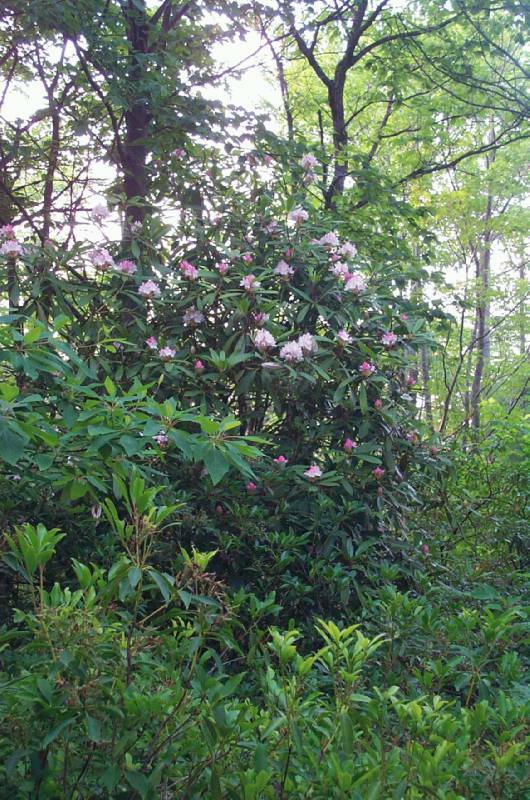 The Wild Area contains large stands of old-growth timber, hundred acres tracts of white birch, and more mountain laurel than you can imagine. 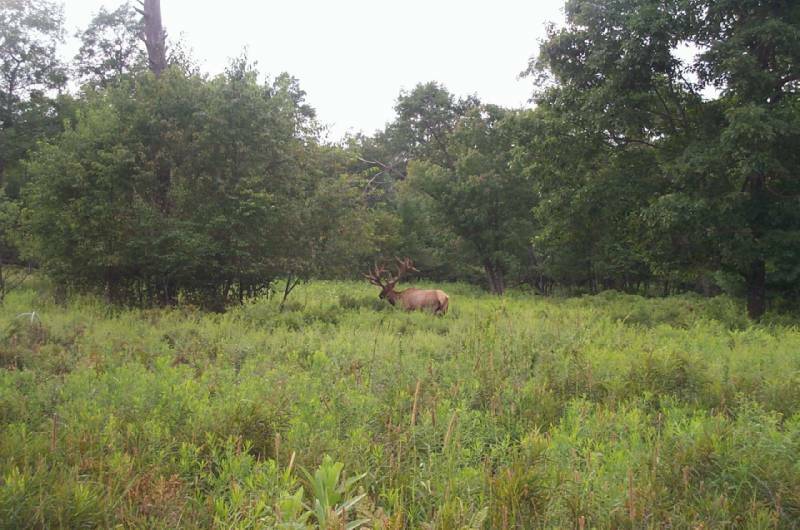 The Quehanna Wild Area is also home to a large population of bear, deer, bobcats, and the favorite of most tourists: the Rocky Mountain Elk. Here the elk herd is thin, and the animals are much more wary than their counterparts in Benezette. This bull elk, seen to the right, was spotted for three straight years on the Three Runs Road, and in 2004 had eight points on each antler, giving it the designation of Monarch. A rare sight indeed. After about four miles on the Three Runs Road (named after three small streams that flow into the West Branch of the Susquehanna River and find their headwaters here), you'll find yourself on the Dutchman's Road. Keep going, and the Jerry Ridge Road will leave to the left. This road runs out along Jerry Ridge, a finger of the Allegheny High Plateau stretching between Lower Jerry Run and Round Island Run (featuring Three Falls, pictured on the left). The valley to the west contains the Lower Jerry Run Natural Area, a remote preservation area for old growth hemlock and birch trees, accessible only by foot. 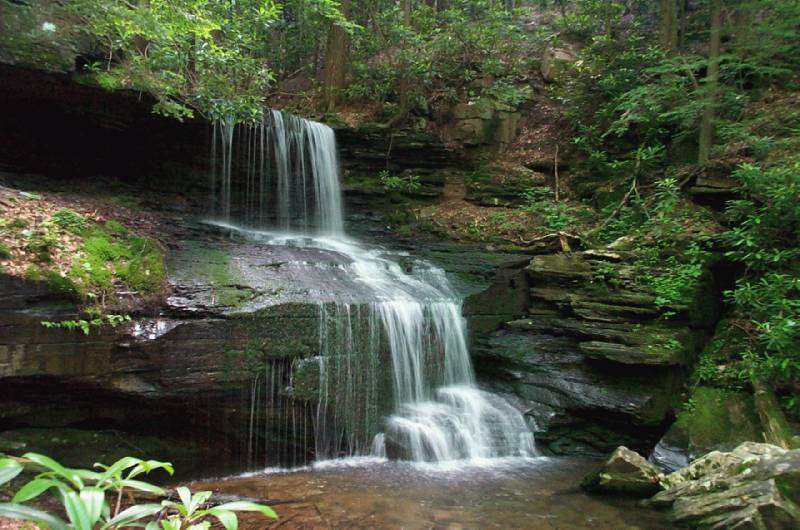 The Allegheny High Plateau is known as a dissected plateau, meaning that streams and rivers have cut deep valleys into the level of the plateau, resulting in scenic canyons and gorges. And at the end of the Jerry Ridge Road you'll find the canyon of one the most scenic streams in Pennsylvania: the Sinnemahoning Creek. This sizable river draws water from Clearfield County and the Penfield area via the Bennett Branch, from Cameron County and Emporium via the Driftwood Branch, and from Potter County in the north via the First Fork. And all three branches combine upstream from the Jerry Run overlook to produces some of the highest riverbank cliffs in Pennsylvania. To the right you can see the Sinnemahoning at the feet of the Jerry Ridge. 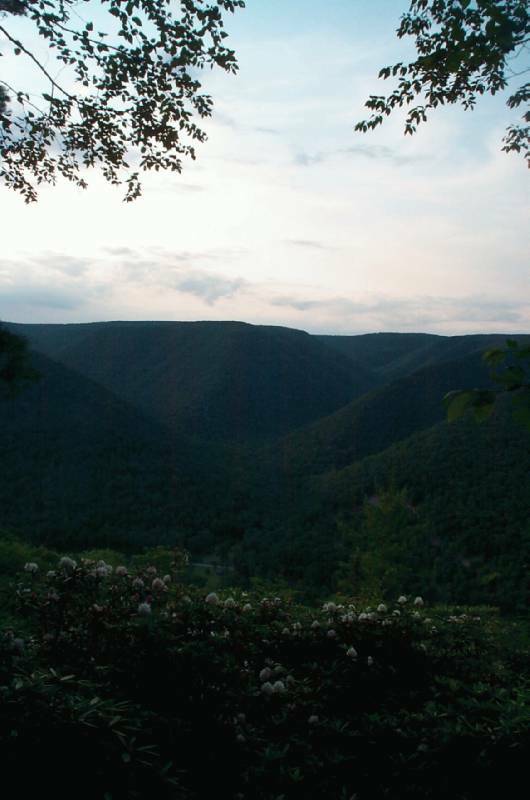 Many of the edges of the High Plateau along the Sinnemahoning Valley provide fantastic views of the gorge. Besides this overlook of Montour Run on the Jerry Ridge, overlooks are accessible on Wyckoff Ridge, Mason Hill, Round Island Ridge, and the Keating Mountain (where the Sinnemahoning joins the West Branch). Many of these spots are remote and difficult to access, but the hike is always worth it. Jerry Ridge Road, however, is just a short hike away from three beautiful vistas of the Sinnemahoning Valley, making it the easiest trip to view the Sinnemahoning Gorge. 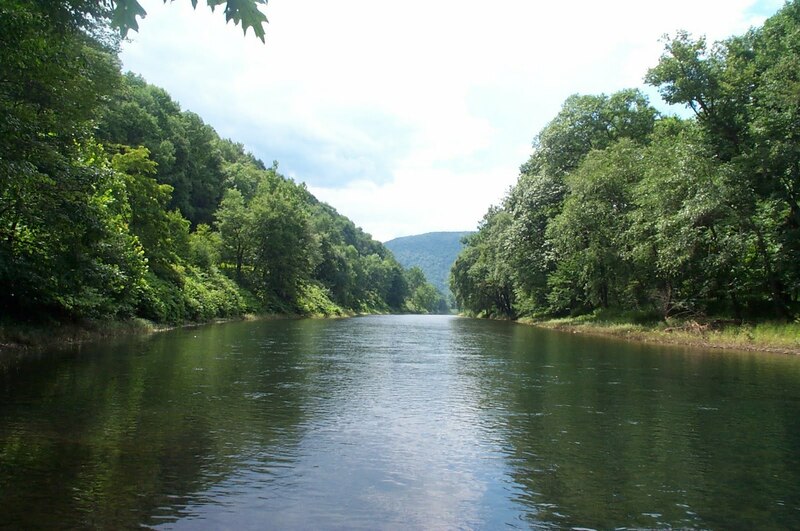 For more information or directions, you can obtain an official map of the Moshannon State Forest and Quehanna Wild Area from the State Forest offices at Parker Dam State Park or in the forest itself.